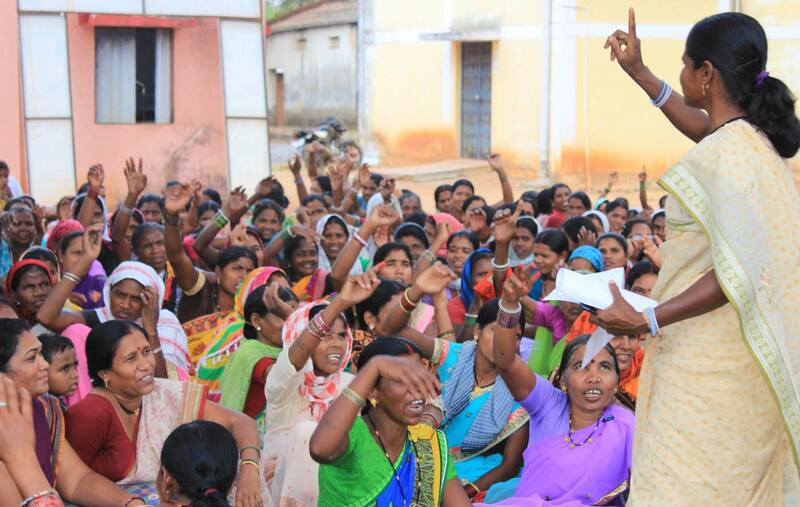 Organized poor women with a united voice are always a force to reckon with. They can bring about many societal changes including ensuring rightful payment of MGNREGS dues. The Police Officer was addressing the members of Ekta Mahila Sangh, the block level federation of women Self Help Groups (SHGs1 ). 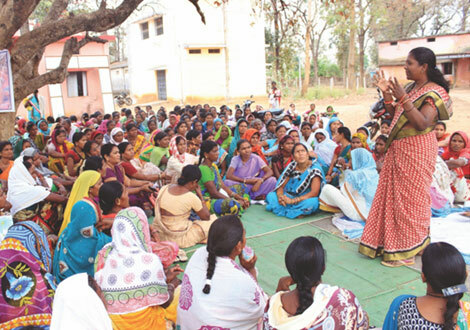 Ekta Mahila Sangh is an association of 515 SHGs with more than 5,000 memberships in Kanker district of Chhattisgarh. Eighty percent members are from indigenous tribal group, the Gonds. About a thousand persistent women members had gathered in front of the block office, with a common purpose. Their wage payment and unemployment compensation under MGNREGS had not been cleared. It was close to a year for some without any payment for past work. Despite constitutional guarantees for work, there seem to be little headway. But this strong grassroots institution of the poor which is a platform for collective action was not ready to give up. Nahi kisi se bheek mangte"
(We are demanding our rights, not begging from anyone). A thousand unorganized poor women is just a mass but a united voice of strong collective is always a force to reckon with. Raising their voice and singing songs, they were in the block office to highlight their grievances, with all necessary documents in tow. It was not the first time that the women were raising this issue. Repetitive demands at various levels had failed to generate affirmative action. Several meetings were conducted at hamlets and villages to concretise evidence-based documentation and creating awareness. Initially officials paid no heed. However, after the initial phases of ‘prayers and petitions’ from the women, when it turned into a collective action involving a thousand of them, the administration was bound to take notice. At the block office, a high-level meeting was called by senior officials, including the CEO of the MGNREGS cell and police officials. The news of more than a thousand women demanding their rightful dues made it to local newspapers. Photographs, quotes and news covering this initiative of largely poor and illiterate but united tribal women got adequate media attention. All grievance applications were accepted and the women got their rightful dues under MGNREGS. (Why have you gathered here? What do you want?) said the Police Officer to members of Ekta Mahila Sangh, the block level federation of women SHGs promoted by Chhattisgarh SRLM and facilitated by PRADAN. 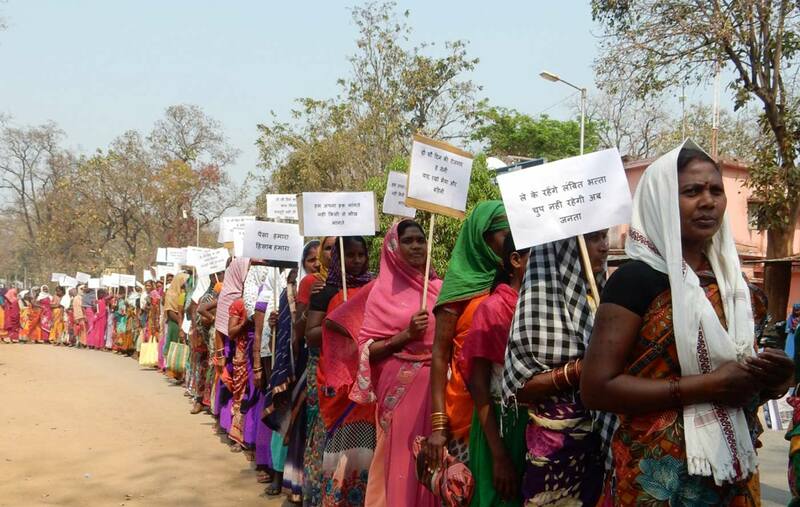 Ekta Mahila Sangh is an association of 515 SHGs with more than 5,000 memberships in Kanker district of Chhattisgarh. Eighty percent of the members are from the tribal group.